Memories of Their First Days of School in the U.S. The first day of school is like a new life for everyone, especially to students who were born in other countries and came to the USA. It is like starting a new page in the story of their lives. "This day was the most important day for me because I have changed. I have new teachers and new friends," said Ruth Zelaya. "I will never forget this day," said Isis Flores. There are some cases where students feel nervous or afraid because they don't know enough English to express their feelings, ideas, or maybe they don't have people to share ideas with. Ricardo Castro said, "I didn't know what to do and it was really hard to make friends because I was shy." "I had no friends in this school and everybody in this school was looking at me. Because it was my first day, nobody was with me," said Yoanny. Confusion is another thing that students feel. Mahidereab said, "I remember two days I didn't eat my lunch because I had no friends and I didn't know which line was for free lunch." Sometimes we need the help of some students or teachers who can understand our situation. Tu-Yin was lucky to find a teacher who helped him when he first came and who continues to help him. "I came across a Chinese teacher. He is Mr. Wang. He became my "always teacher," Tu-Yin said. Nicolson Nelson had a teacher who helped him, too "When I went to Ms. H's class, she was helping me with everything like my plan book. She helped me to fill it out. She explained her class to me and what I had do and what I didn't have to do." Some think that school is like a castle full of magic gifts, but when students first come, it takes a while to find the gifts. 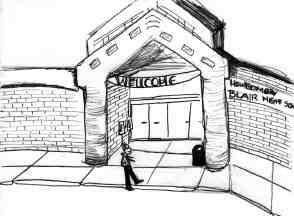 Esbin Villatoro said, "I was very confused because Blair is bigger than Honduras schools. I didn't know anybody at Blair and was late when I went to my first class. Also I didn't know what the teacher was talking about." Some students have problems with other students when they first come. Issac Domingos shared his experience in middle school. "One day in the gym class two boys came to bother me. I didn't want to fight with them because my dad told me to not fight in the school, so I didn't fight with them." The most common problem students have when they first come is the language. It can be difficult, especially for students who are new to English. Weiling said, "I didn't speak English and I didn't know what they said sometimes. And when I needed a pen or pencil or maybe to ask where my classroom was or what period we were going to have that day, I didn't know how to ask for it." But after time the students put all their effort to trying to be better everyday and then students felt better than before. Lisandro Vasquez said, "I speak more English [now] and I want to learn more because I want to go to the college to study and have a better job" he said. Cecilia Quinteros said, "I'm learning English in this country, and today I feel good because I'm learning other cultures, too." All of us have a different experience that some day we are going to remember. The first day at a new school can be one of them. For many, it's a difficult experience being in a new place especially when it is in a different language, too. But after time, everyone adjusts.